Right before Matt and I purchased our Jet-Skis, we decided to take a drive to the east side of the island to check out the beaches there and see if we could find any boat ramps we would be able to use. We live on the west side of Okinawa, which is the East China Sea side. The east side of the island is the Pacific Ocean side. Just a fun fact:) We ended up crossing a bridge to another island and saw some amazing things there. Unfortunately, there was a slight tropical storm going on at the time, so our pictures aren't the best, but it was an incredible experience driving through the island and we will be back in better weather with our camera soon! 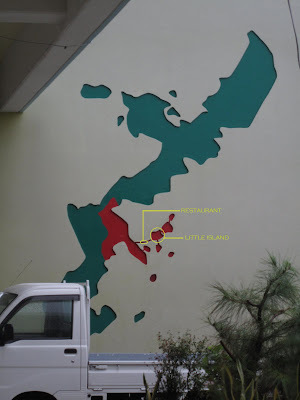 On the way out, we stopped at a restaurant/gift shop that was on the narrow strip of land that connected Okinawa to this other little island that we were headed to. We were basically out in the middle of the Pacific Ocean, and the winds were incredible! I hope to get to show you some photos of this island when it's dry outside! Wish us luck getting Jet-Ski licenses!